A new report links two of Indonesia’s most prominent political figures, one of them a vice presidential candidate, with mysterious offshore financial transactions related to coal companies they owned. The report, from the international anti-corruption NGO Global Witness, suggests that businessmen and politicians Sandiaga Uno and Luhut Pandjaitan both may have taken advantage of corporate secrecy techniques that obscured ownership of companies and flows of millions of dollars in cash. While there is no evidence that Luhut or Sandiaga have engaged in any illegal activity, the issues raised in the report are at the heart of a global financial system that has allowed the tools of corporate secrecy, which can facilitate corruption, tax dodging and conflicts of interest, to spread unchecked. Sandiaga is running for vice president in the April 17 election on a ticket led by former military general Prabowo Subianto. Luhut, himself a former general, is a senior minister and close adviser to the incumbent, President Joko Widodo. JAKARTA — A new report links two of Indonesia’s most prominent political figures, including a vice presidential candidate, with mysterious offshore financial transactions related to coal companies they owned. The report, from the international anti-corruption NGO Global Witness, suggests that businessmen and politicians Sandiaga Uno and Luhut Pandjaitan both may have taken advantage of corporate secrecy techniques that obscured ownership of companies and flows of millions of dollars in cash — techniques the Indonesian government has tried to stamp out as part of its effort to improve governance and tax collection in the country. The allegations touch the highest levels of Indonesian politics as a two-horse race for the nation’s presidency enters its final phase. Sandiaga is running for vice president in the April 17 election on a ticket led by former military general Prabowo Subianto. Luhut, himself a former general, is the current maritime coordinating minister and one of President Joko Widodo’s closest advisers. President Joko Widodo, left, and his running mate, Ma’ruf Amin. 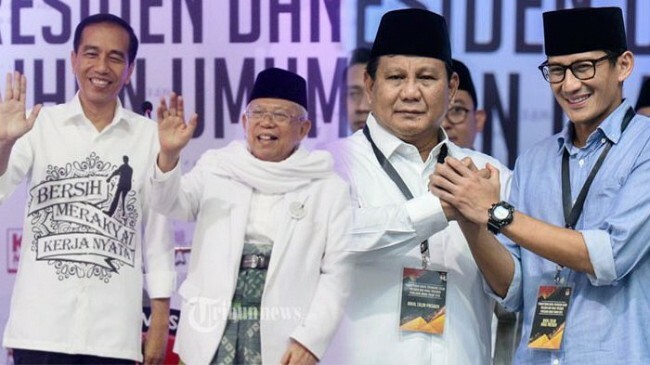 They face Prabowo Subianto, second right, and Sandiaga Uno in the April 17 presidential election. Image courtesy of the Indonesian Cabinet Secretariat. The Indonesian government has tried to crack down on the use of anonymous companies — those whose ownership has been disguised — through a March 2018 presidential order that gave domestic firms one year to disclose their true, or “beneficial,” owners to the state. But it’s unclear whether the policy is being enforced. While the Global Witness report doesn’t suggest that Sandiaga or Luhut broke the law, the offshore dealings by both men have raised questions about a lack of transparency in their business practices. When questioned, both men declined to shed any further light on the subject. The first part of the report focuses on payments made by a coal company of which Sandiaga was a controlling owner, to an anonymous firm in the Seychelles, a small country in the Indian Ocean and one of the world’s most notorious secrecy jurisdictions. The payments, totaling at least $43 million, went from Indonesia’s Berau Coal to Velodrome International in the Seychelles. They took place from 2010 to 2012, at a time when Berau was hemorrhaging money; it later went belly up. The purpose of the payments has never been made clear. Officially, they were for advice on “key strategic, business and operational aspects,” though the specific services to be provided were never explained. After Sandiaga’s firm sold most of its shares in Berau Coal to London-listed Bumi plc, a joint venture between British investor Nathaniel Rothschild and Indonesia’s Bakrie family, the new owners began to raise questions about the payments, which they were now invested in. A year later, they managed to terminate the agreement with Velodrome, as the partnership between Sandiaga’s side and the new owners broke down over allegations of financial and other irregularities. For years, Velodrome’s ownership remained unclear, even as Bumi plc hired a law firm to investigate who had benefited from the payments and other alleged improprieties. Then, in 2016, the Panama Papers leak revealed that Velodrome had been set up and run by none other than Sandiaga Uno himself. He was the sole shareholder and director of Velodrome until May 2009, a few months before the payments started to be made. At that time, control of Velodrome passed from Sandiaga to a Singaporean lawyer named Ng Soon Kai. Now, the Global Witness report delivers another piece of the puzzle: Ng Soon Kai and Sandiaga Uno are “long-time business partners,” fueling suspicions, raised by Bumi plc and others, that the payments to Velodrome may have been “related party transactions,” or ones in which the two parties held a pre-existing connection. In some cases, related-party transactions are legitimate activities, but in others they can be used to facilitate tax dodging or to benefit some shareholders at the expense of others. Based on the available information, it can’t be said with certainty who controlled Velodrome during the period in which the payments were made. The Panama Papers revealed that Ng Soon Kai was the shareholder as of mid-2009, but they didn’t disclose whether he held on to the Seychelles company after that. Still, as the last known shareholder, he would seem to be the likeliest person to have owned Velodrome when it received the money from Berau Coal. Neither Sandiaga nor the lawyer replied to Mongabay’s inquiries. Sandiaga has yet to address the matter publicly. Since tax avoidance may indicate that illegal strategies for evading tax have also been employed, Aryanto called on the Indonesian government to investigate the Berau Coal case. “If companies continue to dodge taxes, it could promote habits that lead to corruption,” he said. Sandiaga Uno, wearing glasses, is a vice presidential candidate in the April 17 election. Image by Anterin.id via Wikimedia Commons (CC BY-SA 4.0). The second part of the Global Witness report details how, in 2016, coordinating maritime minister Luhut Pandjaitan sold a controlling stake in coal miner PT Toba Bara Sejahtra to hidden owners via an anonymous company based in Singapore. While Luhut did not respond to the NGO’s inquiries, he dismissed the significance of the findings in a media scrum outside his office last week. The Singapore company, Highland Strategic Holdings, did not respond to Mongabay’s inquiries on the matter. Neither did Watiga Trust, which holds the shares in Toba Bara on behalf of Highland. The opaque corporate structure means the identities of the true owners of Toba Bara’s coal mines in Kalimantan, the Indonesian part of Borneo, and the coal-fired power plants it’s building on the neighboring island of Sulawesi remain a mystery. “It’s impossible to know whether the new controlling owners of Toba Bara Sejahtra might also be politically connected people, such as government officials, other politicians, their family members, or business associates,” the report says. 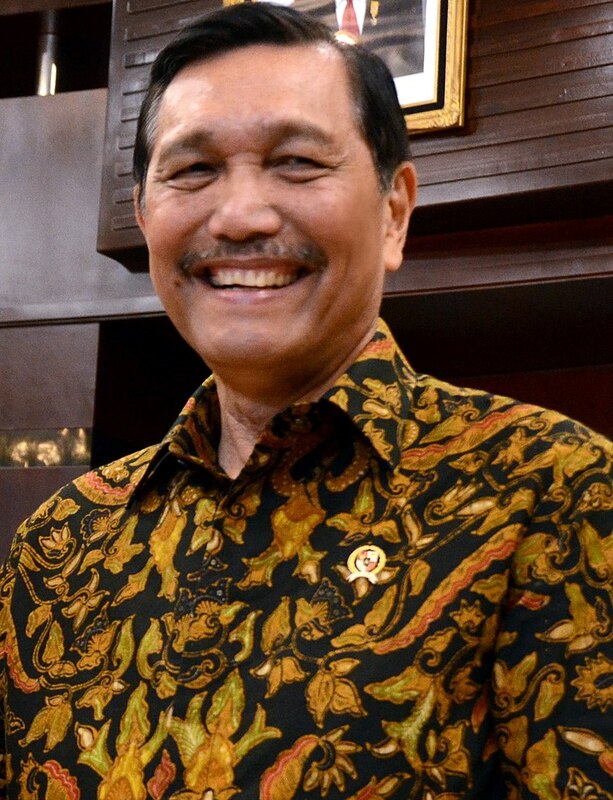 Luhut Binsar Pandjaitan, Indonesia’s coordinating minister for maritime affairs. Image by the Indonesian Coordinating Ministry for Politics, Law and Human Rights via Wikimedia Commons (Public domain). Maryati Abdullah, PWYP’s national coordinator for Indonesia, called on the government to enforce the regulation on disclosing beneficial ownership so that the true owners of these assets could come to light. “Why do companies have to publish and the public have to know about the beneficial owners of companies? 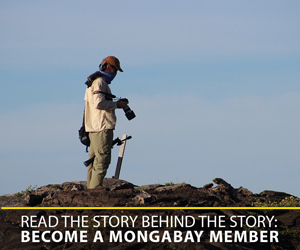 So that they can identify which companies have conflicts of interests with public officials,” Maryati told Mongabay. Aryanto called on the government to move quickly on enforcing the disclosure regulation. Banner image: Coal that fell off a barge washes up on a beach in Indonesia. Image by Junaidi Hanafiah/Mongabay Indonesia.